Over the years Pascoe Engineering has made careful investment in both quality plant and the training of personnel, in consequence, we are well placed to meet the requirements of an increasingly competitive market for Injection Moulding services. The Company has expanded successfully through two recessions and it will come as little surprise to learn that many of the best known OEM’s in Scotland regularly use our sub-contract Injection Moulding services. 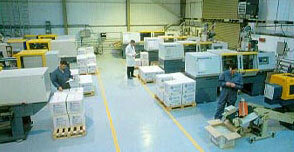 We have a medium capacity plant and currently operate 11 dedicated Injection Moulding machines. Our personnel receive continuous training, both in-house and at local colleges, on the best Injection Moulding practices and techniques, resulting in a highly skilled and versatile workforce. For more details about this service see the case study. In every respect Pascoe Engineering is deeply committed to customer service. We pride ourselves on the quality of our products, our flexible operating structure and our ability to turn around work quickly and efficiently.